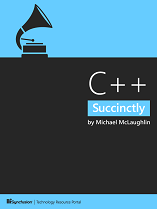 C++ Succinctly was written to help professional C# developers learn modern C++ programming. The aim of this book is to leverage your existing C# knowledge in order to expand your skills. Whether you need to use C++ in an upcoming project, or simply want to learn a new language (or reacquaint yourself with it), this book will help you learn all of the fundamental pieces of C++ so you can understand projects and samples written in C++ and begin writing your own C++ programs.